Beaujolais is often misinterpreted, and certainly misunderstood. ‘Tis the season for Beaujolais Nouveau pre-orders, and everyone wants to get on the bandwagon to get them on the shelf and into the consumers hands! Let me explain: The third Thursday of November is the infamous release of Beaujolais Nouveau. The harvest has been completed, and a quick (Carbonic maceration) fermentation and bottling leads to a light coloured, fruity, bubblegum, kirsch concoction known as Beaujolais Nouveau. Not meant for ageing, and earlier than early consumption. Analysis: drink immediately upon purchasing! These wines can be fun, and certainly appealing to many consumers. But Beaujolais is more than this. It can be very serious, but sometimes that seriousness gets lost amongst the Nouveau crowd. There are nine crus in Beaujolais, all of them offering slightly different soil compositions, microclimates and terroir. What remains the same is the grape variety: Gamay. Of those nine crus, three of them are bigger and more powerful, and certainly have the ability to age. Fermentation is done with the more traditional crush as opposed to carbonic maceration. Let me give you the Cole’s notes version on carbonic maceration: It is a whole berry fermentation. The grapes are placed in a big vat, and the resulting weight of the berries causes the ones on the bottom to be more broken and crushed, starting the fermentaion process as we know it (yeast combining with the sugars to create alcohol and carbon dioxide) but the ones on the top remain as whole berries. When the fermentation process begins, a carbon dioxide rich environment is created, and rising to the top, the whole berries are bathed in the C02, causing fermentation to occur on an intracellular level, fermentation taking place inside each single, still intact berry…literally, from the inside out. The resulting wines are much lighter in colour and lower in tannic structure, since there is minimal skin contact. So while many Beaujolais are known for the above, the following three crus (of nine) will be the antithesis of the fruity, bubblegum, fuschia pink Nouveaus – Fleurie, Morgon and Moulin-A-Vent. 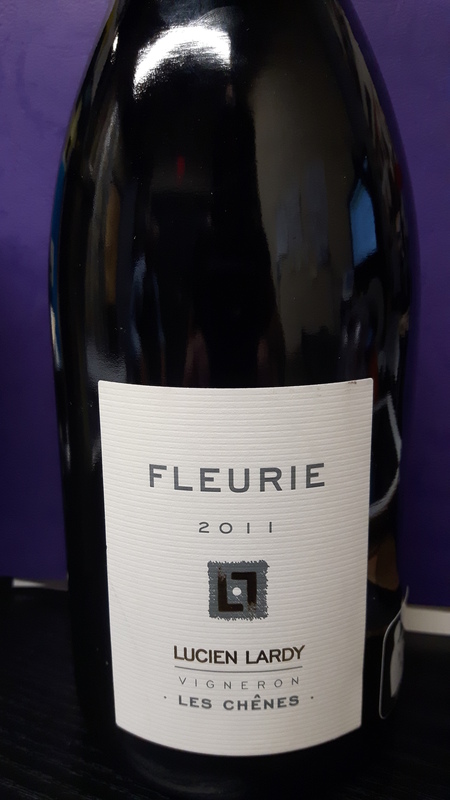 Today’s wine is a Fleurie from Lucien Lardy, the founder of the Terroir Originels Group, a community of vintners who farm independently, yet they all share the same vision to conserve the heritage of Beaujolais, and to respect the individual terroir of each cru. Contrary to popular belief, this wine can age. I’m not one for Beaujolais, but I really like this and unlike the Nouveau, this wine is purple, deep, dark and brooding with red fruits of raspberry, red and black cherry on the nose, with undercurrents of spices. A slight earthiness on the palate along with more black fruit and baking spices. The tannins are quite soft due to the ageing in (neutral) oak for 12 months. A very balanced wine, with light alcohol and that great acid structure for ageing! According to Mr Lardy himself, this wine can age for 10 years or more! Enjoy with the traditional bean cassoulet, mushroom dishes, even pork or beef dishes. On the shelf for $30.95! Santé! This entry was posted in Education, Thirsty Thursday, wine and tagged Beaujolais, carbonic maceration, cru, dark, Enotri, Fleurie, France, Gamay, Lucien Lardy, Morgon, Moulin-a-Vent, Nouveau, November, release, Thirsty Thursday, Thursday. Bookmark the permalink. Thank you! Please tell others about it! I really like Beaujolais, nouveaus or not. It’s definitely a different genre that’s for sure! But the Nouveaus seem to still be all the rage come November!